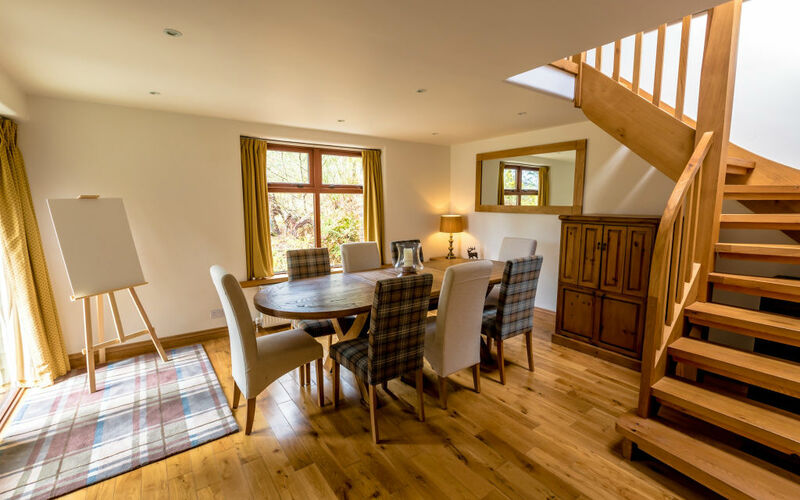 Ivy Cottage has had a recent redecoration and transformation in 2018. Bedroom 1 : A compact bunkbed room complete with en-suite bathroom and ideal for the younger members of the family. Bedroom 2 : A single bedroom that faces Loch Nevis and is sited directly opposite the spa bathroom / w.c. This room can be configured as a double on request. 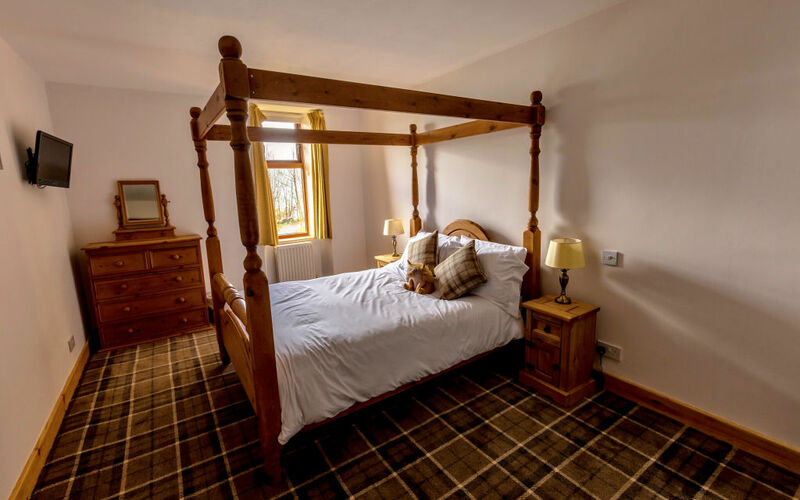 Bedroom 3 : Master Bedroom 4 post double bed beautifully furnished with tv sealoch views facing Loch Nevis and directly opposite the shower w.c. Kitchen : Oak floored fitted kitchen with gorgeous views across Loch Nevis and window seats perfect to drink in the views with your morning coffee. Microwave, induction hob, oven, nespresso, coffee maker, fridge freezer, baking and cooking utensils, dishwasher, bread maker and beautiful crockery selection for your stay. Basic cupboard selection to get you started i.e condiments, oil and spices. Living Room : Oak floored, raised ceiling with rounded plasterwork and natural original stone walls. A beautiful family space which makes maximum use of the natural daylight flooding in from the windows around this room. A large central raised woodburning stove to cosy up in front of, in the evenings. Honesty box telephone and wifi throughout. Armchairs, 3 seater and 1 seater chesterfield settee, large smart TV, ipod dock and charging stations. There is a wonderful Ivy Cottage library of handpicked books on local knowledge and childrens Scottish tales to keep all ages entertained. Bedroom 5 : Above the Dining/ Games room there is a large kingsize double bedroom. 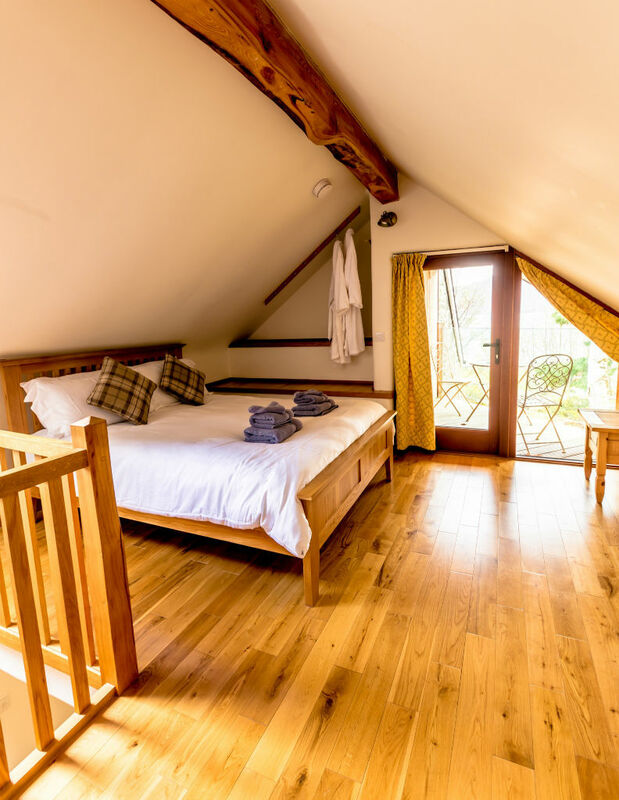 It has a beautiful handmade oak staircase and balcony with bistro table and chairs for alfresco breakfast or a starry nightcap before retiring for the night. 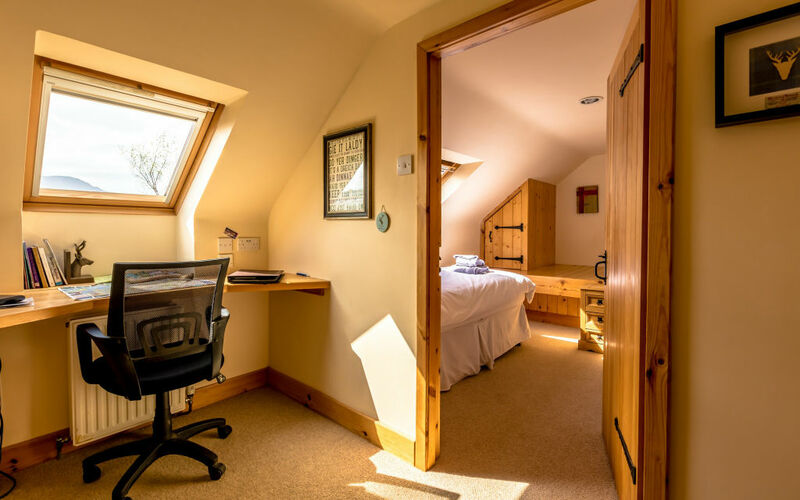 Study area : A relaxing desk area with Knoydart outlook to catch up with emails or retreat to and read at your leisure with all the information you could possibly need to ensure a fantastic holiday stay on Knoydart. 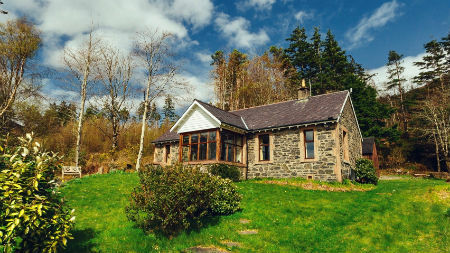 Get Here - Reaching Ivy Cottage is part of the adventure and will allow you to pass through the most stunning Highland scenery. You will require to take a water taxi from Mallaig to Inverie. By Car Take the A82 to Fort William (approximately 2.5 hours from Glasgow, 1.75 hours from Inverness) and then the A830 to Mallaig (approximately 1 hour). Take the inner most pier and draw up alongside the blue bollards where you can pick up the ferry to Knoydart. Cars can be parked safely in Mallaig during your stay as the ferry is foot passenger only. By Train The Scottish scenery by train Scotrail is breathtaking, on the famous West Highland Line from Glasgow to Mallaig. The journey takes 5 1/2 hours, departing from Glasgow Queen Street Station. During the summer months you can opt for the ‘Jacobite‘ steam train which departs from Fort William and was made famous in the flying car chase Harry Potter movie. There is an excellent overnight sleeper service from London Euston to Fort William which connects with the Mallaig service and the ferry service. By Ferry Sail on Western Isles our local ferry provider 25-45 minutes depending upon the boat being used you can book direct on 01687 462233 or online. There is also an excellent private charter service Minch Adventures who can be booked outwith ferry times to suit your parties requirements. By Air You can fly direct from your port of departure to Inverness. You will require to hire a car in Inverness airport and the scenic drive to Mallaig takes approx 2.5 hours with coffee stop. Please note hire cars must be left in Mallaig during your stay. You can of course hire a taxi from Inverness direct. Alternatively we recommend a flight direct into Glasgow airport here you can pick up the train that travels the west coast line to Mallaig. By Foot You can walk into Knoydart from Kinlochourn which is a full days walking. An alternative option is to split the journey up with an overnight stay in the bothy at Barisdale. 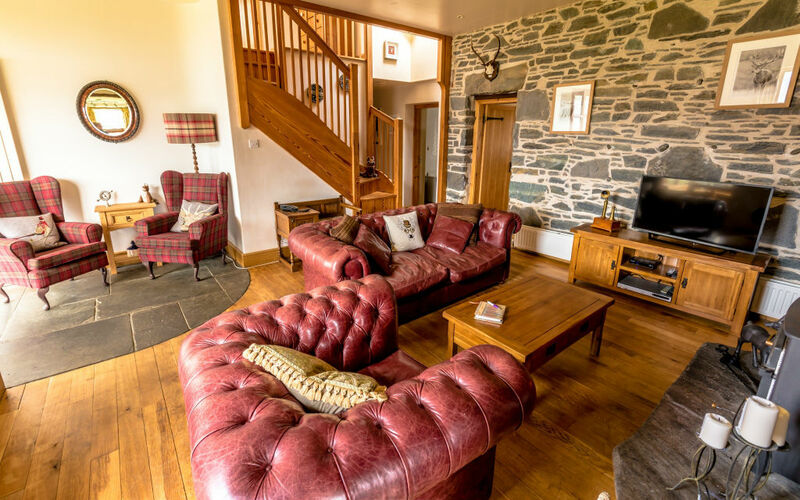 You can also walk in from Glen Dessary or Glenfinnan. Our excellent Ranger Knoydart Foundation Ranger Service can assist you in planning your route in safely. * PayPal online booking facility coming soon. Prices listed may vary, please enquire for availability and rates.